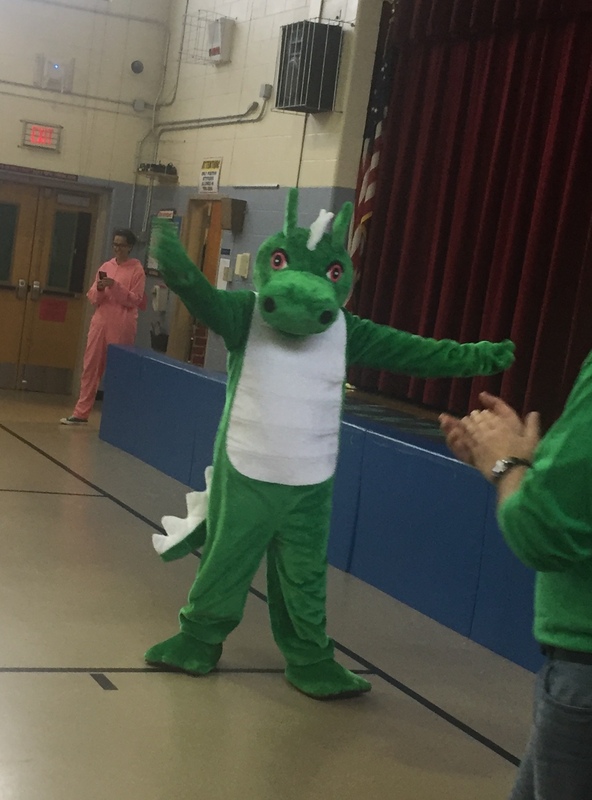 Dragon News: Week of 1/1 at Allenwood! Happy New Year Allenwood Families and Friends! Hope everyone had a happy and safe holiday recess! 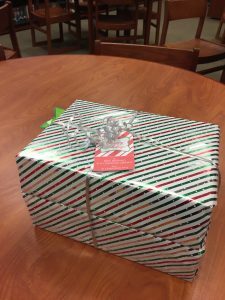 In the week leading up to break, the PTG organized and wrapped in bundles the 140 Scholastic books we purchased, surprising each of our 22 homeroom teachers at Allenwood, adding to their classroom libraries and show our thanks for their hard work and dedication to teaching our children all year long! We also purchased and donated narrative nonfiction and sports stories packs for 18 new Scholastic books to be added to the shelves of the school library! Skittles first visit at Allenwood was well received and thank you to Dr. O’Connell for allowing Skittles to stop by! Keep watch for info on Skittles next appearance at our January Dining Out on 1/21 at MJ*s! Thank you to all that attended our first Family Fun event over the break bouncing all that holiday energy out at House of Bounce. More fun events to follow, watch for updates! It’s Time to Be Part of the Cast & Crew of this year’s performance, Jukebox Time Machine!! Acting in the Theater Club is open to all 4th and 5th graders. and the Tech Crew is open to a LIMITED number of 5th graders as well. If you are planning to sign up for Theater Club, please read BOTH pages VERY carefully! 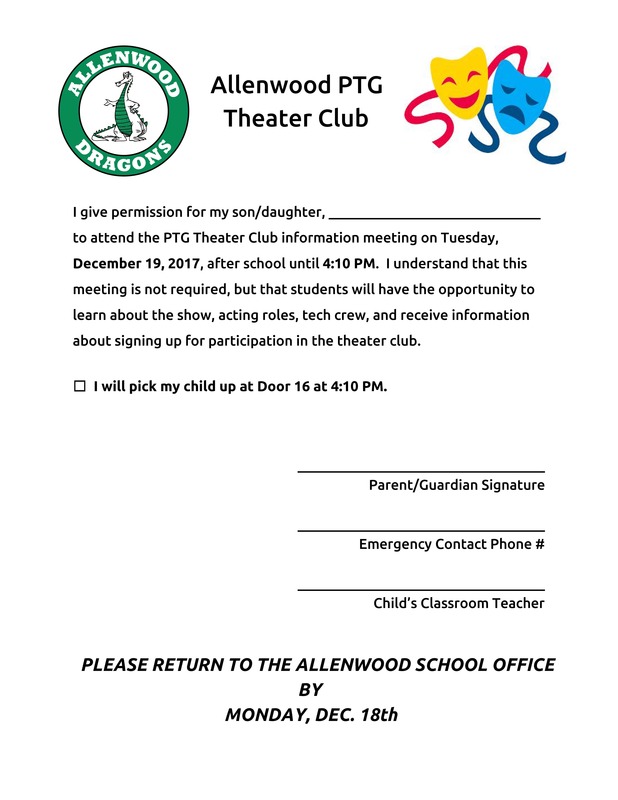 Theater Club Information is below, Registration Form and Activity Fee DEADLINE IS TUESDAY, JANUARY 2, 2018! 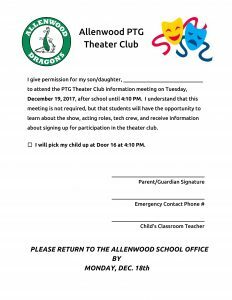 Please return the completed Registration Form and Activity Fee to the Main Office in an envelope marked “Theater Club” by the sign up deadline of TUESDAY, January 2, 2018. Get important Allenwood updates and reminders! In November we launched Allenwood PTG Remind notifications and have received great feedback from those families that have signed up! “Remind” is a free secure app that can be downloaded to any iPhone or Android device. To participate in receiving Allenwood PTG text message reminders, simply text 81010 with the message @allenwood. Rest assured that you will not receive advertisement texts and your phone number will remain private. You may choose to opt out at any time by messaging ‘stop’ to the above number. 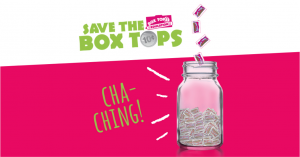 Keep clipping and sending in those box tops for Allenwood! 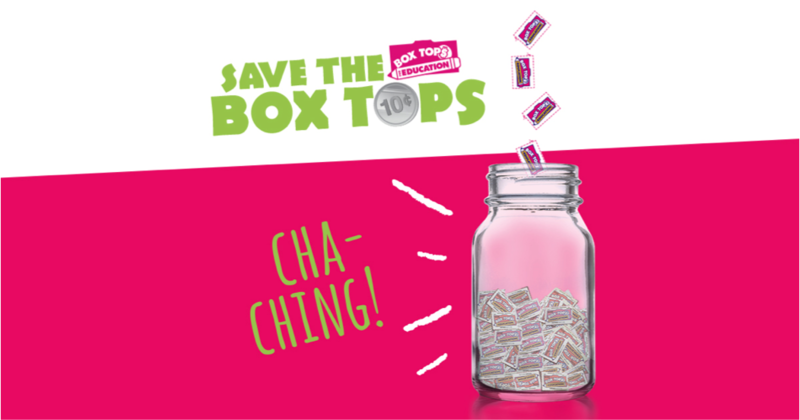 Please put them in a baggie with your child’s name and teacher and send in! Dining Out continues in January with a special appearance by Skittles! Mark your calendars for Sunday, January 21 at MJ*s. More details to follow! It’s time to order! $30 per hardcover book includes large full color pages and lots of candid photos. Books are for sale ONLINE ONLY now thru February 23, 2018. To guarantee your child a book, you MUST order by 2/23/18 for delivery during the last few days of the school year. Special add on features are also available, including custom naming, icons and a clear photo pocket for keepsakes. Customization is done through the yearbook purchase before adding it to your cart. Please be sure to enter the name of your child’s teacher in the homeroom field! To purchase your book, you must order it online. 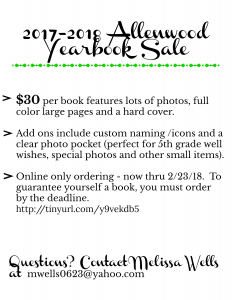 A link to the yearbook website can be found on awptg.org, on the District website under the Allenwood tab on the Wall Backpack or you may use the link below to purchase your book. House of Bounce Family Fun Event Tomorrow, 12/28! Siblings & Future Dragons welcome! Snacks will be available for purchase! Skittles first visit at Allenwood was well received and thanks to Dr. O’Connell for allowing Skittles to stop by! Stay tuned for details on Skittles next appearance at our January Dining Out on 1/21 at MJs! Happy Holidays from Allenwood PTG! Sending you and yours good cheer and best wishes for a wonderful holiday season and new year! 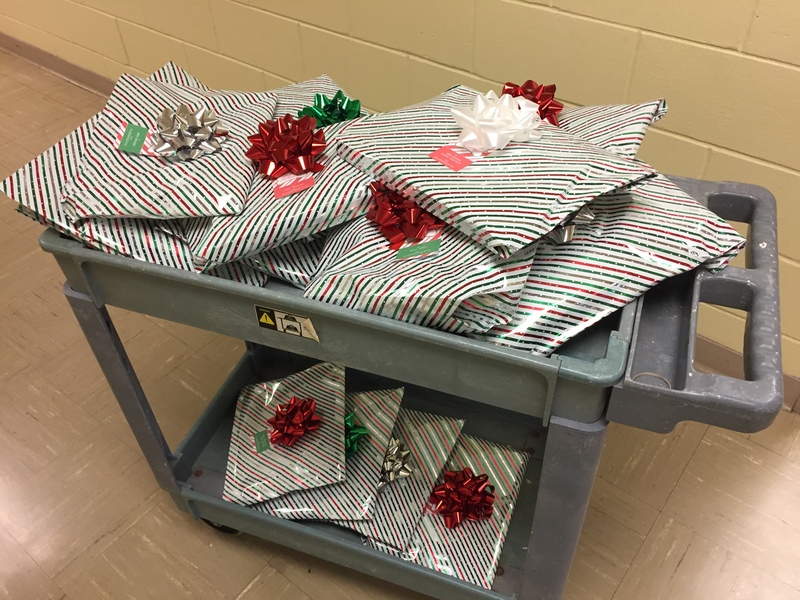 In the week leading up to break, the PTG organized and wrapped in bundles the 140 Scholastic books we purchased, surprising each of our 22 homeroom teachers at Allenwood, adding to their classroom libraries and show our thanks for their hard work and dedication to teaching our children all year long! We also purchased and donated narrative nonfiction and sports stories packs for 18 new Scholastic books to be added to the shelves of the school library! Download and print our packet for this year’s performance, Jukebox Time Machine! 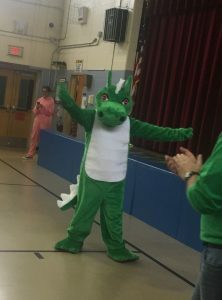 Dragon News: Week of 12/18 at Allenwood! Hello Allenwood Families! Only 5 more wake ups until the break! 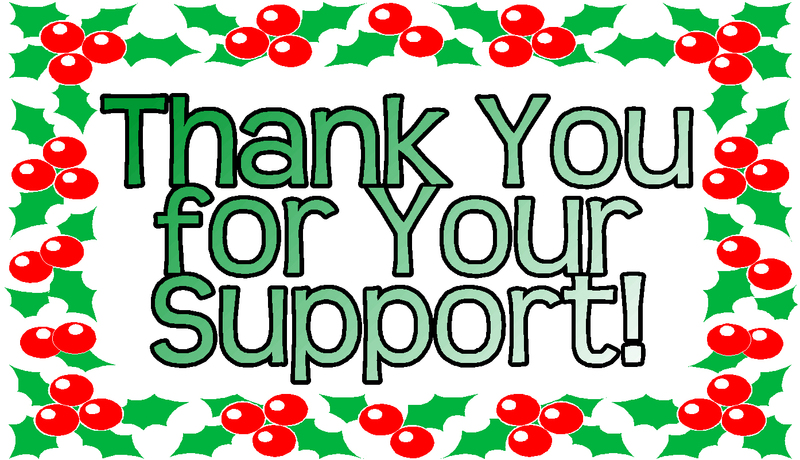 This past week the December PTG Meeting was held and thank you to all of the members and Class Parent Organizers that attended. CPOs will be sharing important information with their classes soon. 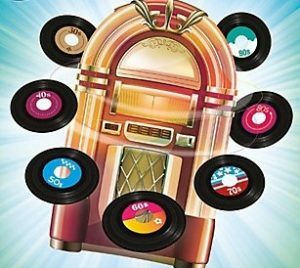 Information meeting on our new production, Jukebox Time Machine, to be held on Tuesday, 12/19, after school until 4:10 PM. The meeting is not required, but students will have the opportunity to learn about the show, acting roles, tech crew, and receive information about signing up for participation in the theater club. 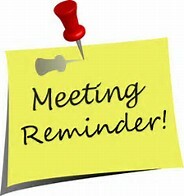 Permission slip to attend the meeting MUST be returned by Monday, 12/18. Download permission slip here. Special add on features are also available, including custom naming, icons and a clear photo pocket for keepsakes. Customization is done through the yearbook purchase before adding it to your cart. 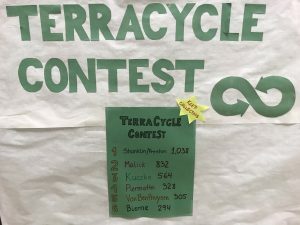 Please be sure to enter the name of your child’s teacher in the homeroom field! 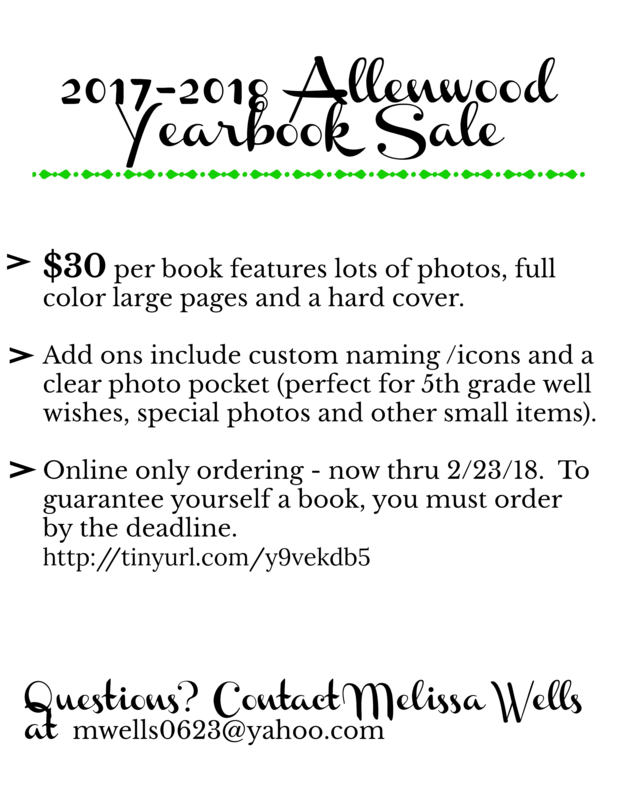 A link to the yearbook website can be found on awptg.org, on the District website under the Allenwood tab on the Wall Backpack or you may use the link below to purchase your book. Allenwood is celebrating with a Holiday Themed Spirit Week from December 18-22! Please see the schedule below for the December’s Spirit Week as determined by the District. 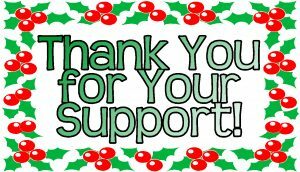 Thank you to all our incredible PTG members, volunteers, Allenwood teachers and staff volunteers, because of your dedication and hard work, our events and programs have been great successes. Thank you so much for your commitment of time and energy! The Executive Board wishes all our Allenwood families a wonderful and safe holiday! See everyone in January! There will be an after-school meeting for all interested students on Tuesday, December 19th from 3:20-4:10pm. Come learn about the show, the parts, the stage crew, the songs and more! 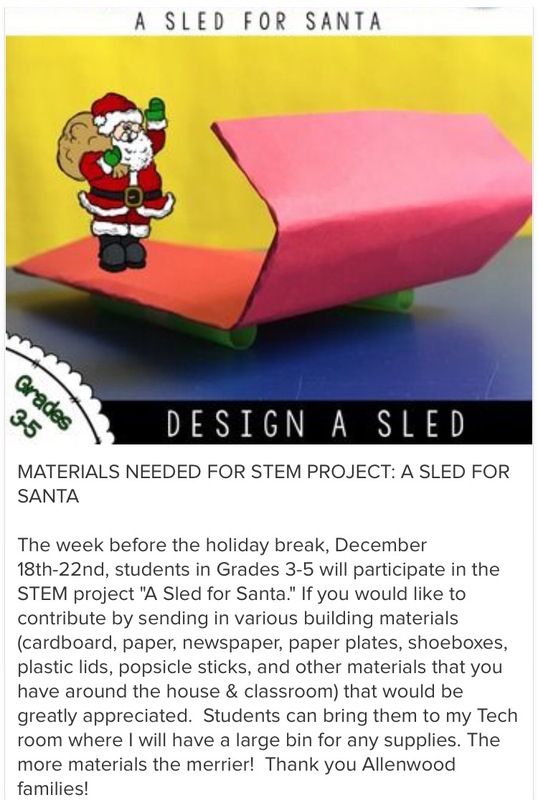 If you are interested, please complete the permission slip and return to the Main Office by Monday, December 18th. Please contact Pam Tigar tigartwo@optimum.net with any questions. 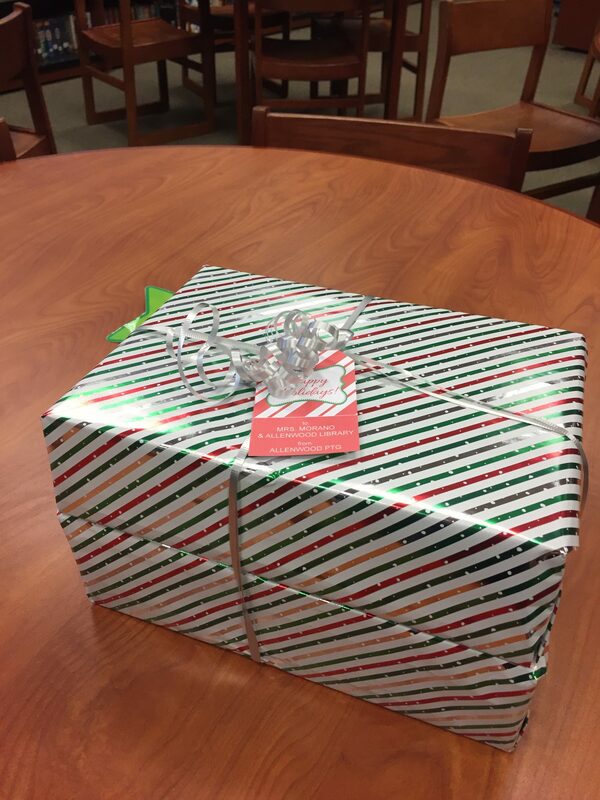 Congratulations to Mrs. Shanklin and Mrs. Preston’s class to the first class to collect over 1,000 qualifying items! 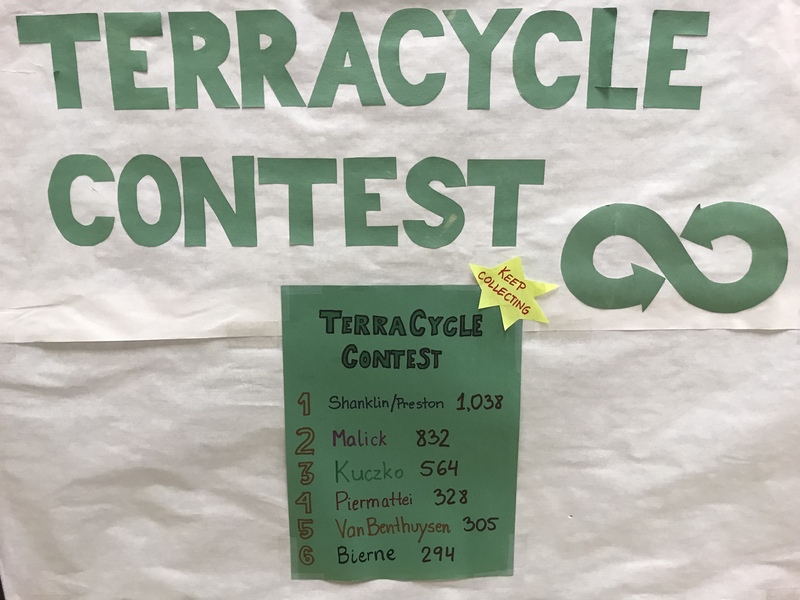 They are in the lead for the TerraCycle contest, followed by Mrs. Malick for 2nd and Mrs. Kuczko for 3rd. To date we have collected over 22 lbs of snack bags !!! Hello Allenwood Families! Hope you enjoyed the snowy weekend! 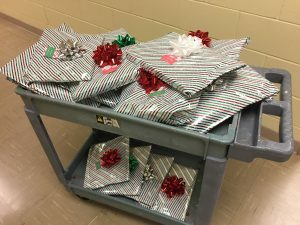 This past week the students shopped at the Holiday Shop for all their treasures for loved ones. 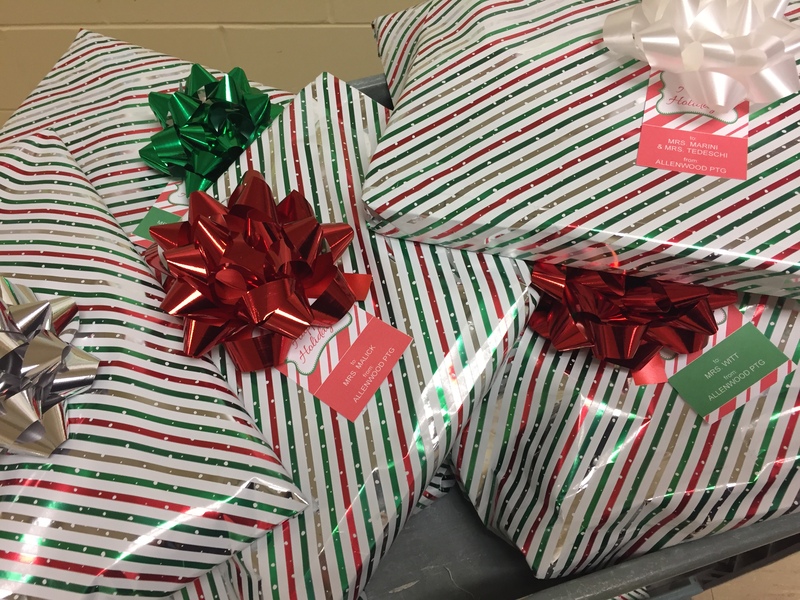 Thank you to all the awesome volunteers helped the students shop and wrap the special purchases and Susan DeSimone for organizing! 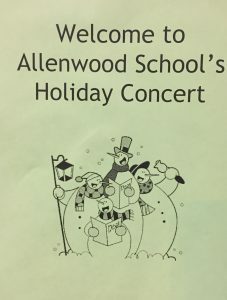 The Winter Concert was huge success and put everyone who attended in the holiday mood! A big thank you to Mr. Brown and Mrs. Ko for another great show, to Ms. Laurie and staff, and to all our fantastic teachers who came out to chaperone! 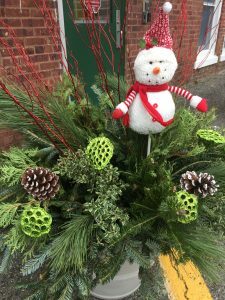 The main entrance pots at the school are very festive thanks to the Forcellati Family! 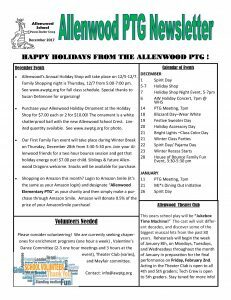 The December Allenwood PTG Newsletter was published to be sent home. Download here for additional copy. 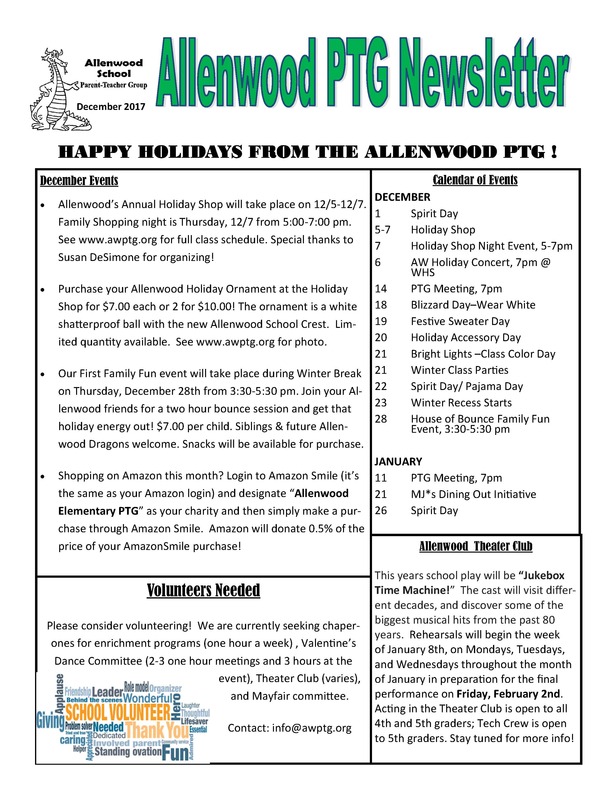 PTG meeting Thursday night, Allenwood Cafeteria, 7 pm. ALL Class Parent Organizers (CPO) to attend as important information will be shared. 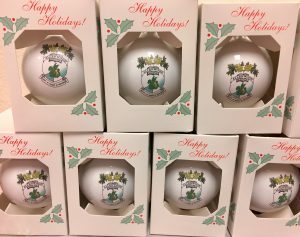 Ornaments will be available to purchase (Cash or check payable to Allenwood PTG). Have you ever wanted to travel back in time? Our Allenwood Theater Club will do exactly that as they take a trip through their amazing, Jukebox Time Machine! As the cast and crew visit different decades, they discover a few fun facts from the time machine tour guides and then check out some of the biggest musical hits from the past 80 years. The holiday season is here! 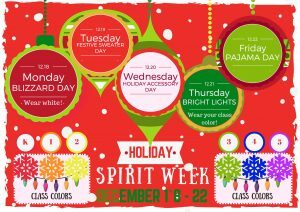 Allenwood is celebrating with a Holiday Themed Spirit Week from December 18-22! Gather your items together soon for a less stressful week ahead! Please see the schedule below for the December’s Spirit Week as determined by the District. HOLIDAY SHOP FAMILY NIGHT SHOP! We invite everyone to shop on TONIGHT, December 7 from 5-7 pm. Please enter through the rear doors (#10) around the back of the gym by the swings for the Night Shopping Event. 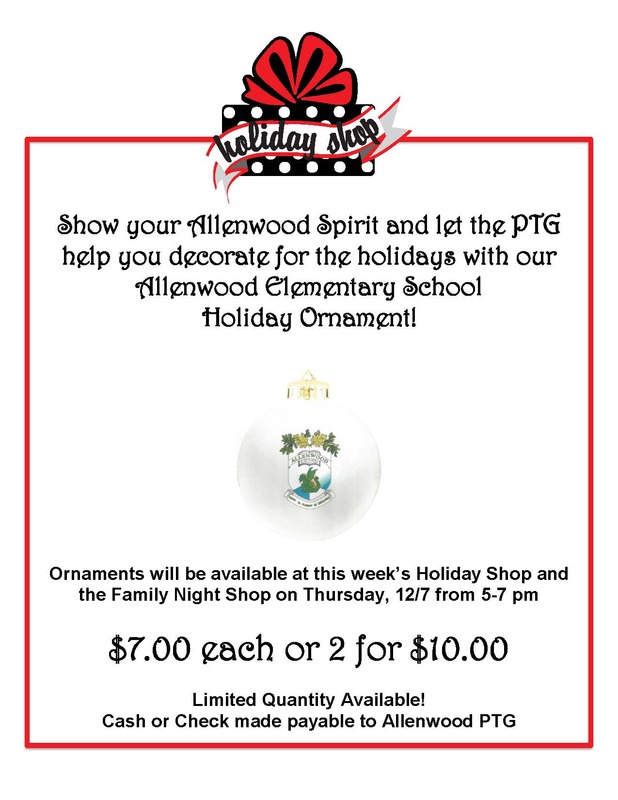 Show your Allenwood Spirit and decorate for the holidays with an Allenwood Elementary School Holiday Ornament! 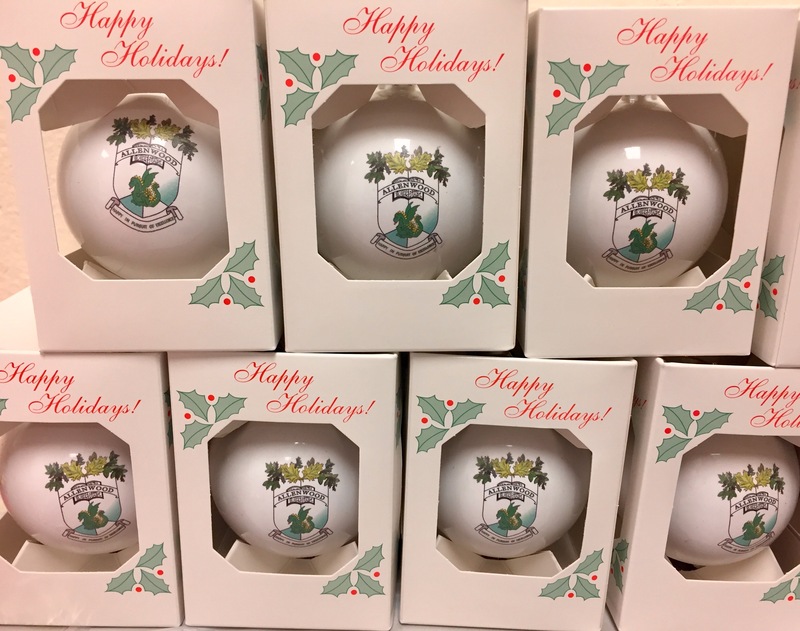 Purchase your Allenwood Holiday Ornament at the Holiday Shop for $7.00 each or 2 for $10.00! 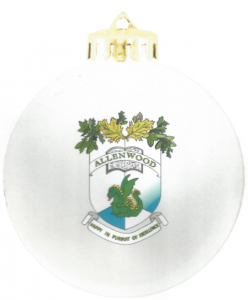 The ornament is a white shatterproof ball with the new Allenwood School Crest. Limited quantity available. 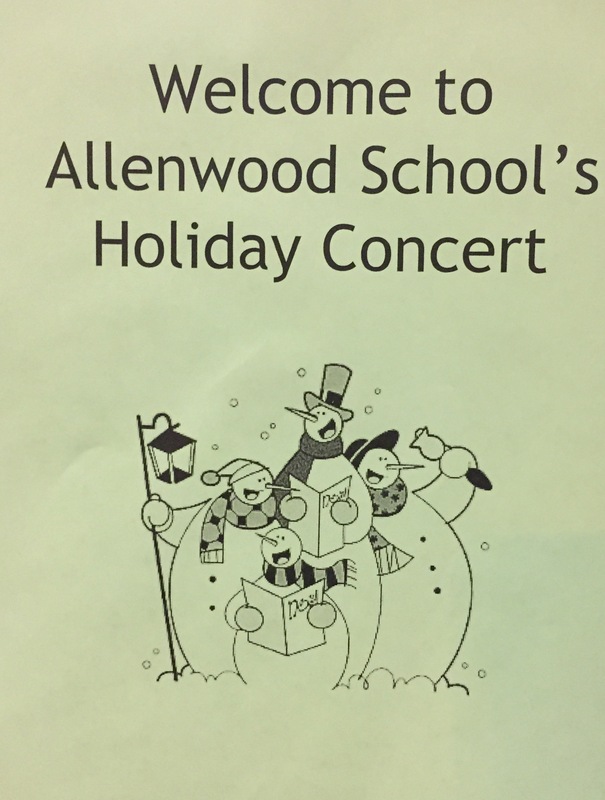 The Winter Concert was huge success and put everyone who attended in the holiday mood! A big THANK YOU to Mr. Brown and Mrs. Ko for another great show, to Ms. Laurie and staff, and to all of our fantastic teachers who came out to chaperone!! 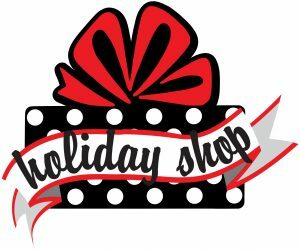 Holiday Shop Committee will be holding our annual Holiday Shop this week. This year the Shop will be open on Tuesday, December 5-Thursday, December 7. We invite everyone to shop on Thursday, December 7 from 5-7 pm. Please enter through the rear doors (#10) around the back of the gym by the swings for the Night Shopping Event. We’d love to have a few more pairs of hands to help the students shop and wrap the special purchases at the Holiday Shop. The shop will be open Tuesday, Wednesday, and Thursday from 9:30-2:00 AND Thursday night 5-7pm. 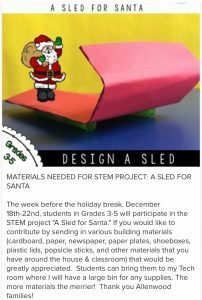 If you have time, sign up at tinyurl.com/y99aulj5 to help or contact Susan DeSimone dsagdesimone@gmail.com. The kids love to shop and their excitement will certainly get you into the holiday spirit!! Budget Helper Envelopes will be sent home with the students that will help plan their shopping and stay within budget. Most items are within the $1-$5 range. Rehearsals will begin the week of January 8th, on Mondays, Tuesdays, and Wednesdays throughout the month of January, all in preparation for our final performance on Friday, February 2nd, right here on our Allenwood stage. Acting in the Theater Club is open to all 4th and 5th graders, and the Tech crew is open to 5th graders as well. We hope you all will join us for this awesome production! Stay tuned for more information to sign up! Our First Family Fun event will take place during Winter Break on Thursday, December 28th from 3:30-5:30 pm. Join your Allenwood friends for a two hour bounce session and get that holiday energy out! $7.00 per child. Siblings & future Allenwood Dragons welcome. Snacks will be available for purchase. 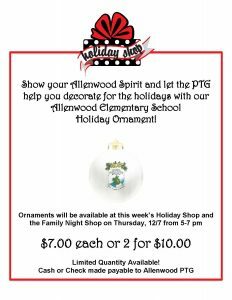 Have a great week and thank you for your support of the Allenwood PTG!